Sally’s original goals for the women’s retreats were simple: to give women a solid grounding in the basics of drumming and rhythm (proper djembe and hand drum technique; finding and keeping an even beat; playing in three and four; accurately subdividing beats; accurately playing syncopations), and gaining the skills and confidence to drum in a variety of situations. As more women became experienced players, she continued looking for ways to help them grow as drummers and musicians. Now intermediate and advanced players can learn more advanced hand drumming techniques, playing additive (compound) rhythms, world rhythms and rhythmic theory, tihais, independent coordination, polyrhythmic playing and listening skills, and soloing and accompanying skills. Players of all levels are also encouraged to use their voices and bodies to help root rhythm deeply in the body, entraining the whole person, and the group, quickly and effectively. 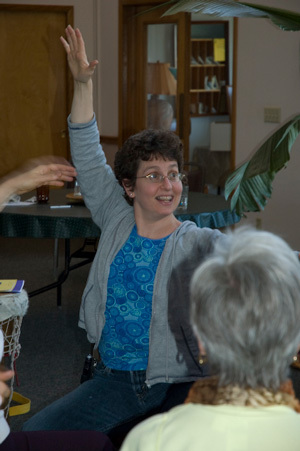 Sally includes breakouts in movement, dance, and voice, taught by highly experienced and supportive facilitators. Women who are “shy” singers or dancers can overcome their shyness in a safe and playful environment, and improve their own drumming immensely over the course of a weekend through these activities. Beyond these basic skills, Sally also provides many opportunities for women to explore the larger world of percussion, rhythm, music, and dance through breakout and focus sessions that reflect her own interests as an ethnomusicologist and improvising musician. In the past, these have included guided music improvisation sessions, Japanese taiko drumming, West African dun dun and dance, Middle Eastern dance and drumming, chant from around the world, “Stomp!”-style found percussion breakouts, Polynesian flaming poi spinning, drum circle facilitation, and more. These sessions have introduced many women to talents they never knew they had, and have given them a safe and fun opportunity to try new things. So over the years, Sally’s goals for the weekends have evolved, based on the needs of the women who come, and on things she wants to explore herself. When women are ready, she gives them opportunities to facilitate classes or drumming circles, and even the most advanced players continue to be challenged in new and different ways. Sally’s goals now are for everyone to leave playing at their next higher level, with greater confidence and understanding; to have a wonderful time; and to experience musical, creative, and personal growth.